As the amount of management data that is gathered continues to grow, the data is not being used effectively for IT business-relevant decisions. IBM Tivoli Data Warehouse helps solve this problem by being the central repository in which you can store historical data about your IT infrastructure. This includes network devices and connections, desktops, hardware, software, events, and other information. Stored data is subsequently analyzed and used to produce reports about the behavior of IT components and services. 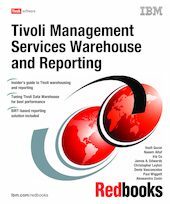 This IBM Redbooks publication discusses all aspects of IBM Tivoli Data Warehouse V2.1 (the version that is shipped with IBM Tivoli Monitoring V6.1) including deployment best practices, scalability, performance optimization, external data integration, reporting, and troubleshooting. As part of the book, we provide a reporting solution for Tivoli Data Warehouse data, which is based on the Business Intelligence and Reporting Tools (BIRT) technology. BIRT is a free, Eclipse-based reporting tool. We also provide an example of a commercial reporting solution: The Crystal Reports solution from Business Objects. We also discuss two solutions that are published on IBM OPAL Web site: QuickReporter for IBM Tivoli Monitoring from Primeur and Warehouse Designer for IBM Tivoli Monitoring 6.1 from Axibase. Both products are IBM certified solutions, specifically designed for IBM Tivoli Monitoring. This book is a reference for IT professionals who implement and use a Tivoli Data Warehouse environment.